Capped composite decking is a mix of recycled wood fibers and recycled plastics such as recycled plastic shopping bags. In fact, a 500 square foot capped composite deck is made up of over 140,000 recycled plastic bags. The decking boards are then capped with a plastic covering that resembles real wood, and which resists mold, staining, and fading. The process of capping composite deck boards has skyrocketed the popularity of composite decking among homeowners who want the beauty of a wooden deck without the associated maintenance. Current capped composite decks are safe, maintenance-free and extremely long-lasting. While wood has historically been the primary choice for deck materials, composite decking hit the market as an alternative choice in the early 1990s. Composite decks, with their recycled-fiber construction, represented an eco-friendly choice and offered a partial solution to the issue of deforestation. Homeowners were able to get a deck added to their home without creating an additional demand for more lumber. As composite decking became more popular, issues began to emerge. Earlier generations of composite decks – up until about 2010 – did not have a coating, or cap. Because of this, moisture could get into the boards which allowed for mold growth, and as a result, these composite models were not long-lived. Additionally, the composite was prone to fading from sun exposure. However, the advent of capped composite solved these issues by adding a protective coating over the composite boards. From 2010 onward, most composite decking materials have been capped. Since a non-capped composite deck won’t last nearly as long as a capped composite, we don’t offer nor recommend installing a composite deck which isn’t a capped composite brand or model. Capped composite decks, on the other hand, will last more than 25 years. The “cap” in capped composite refers to a protective cover, coating the composite material. This cover protects the board, eliminating the issues that previous generations of composite decking had. Capped composite decking will not grow mold, crack, or peel. And because composite deck is so dense, it also won’t become infested with termites or other insects – insects can simply not bore into the material. Additionally, the capping prevents the composite from fading or staining. Because the capping process protects the composite material, capped composite decks do not need to be refinished, and they don’t require the regular maintenance wood decks require (like sanding, painting, staining and sealing). Most capped composite products are much more durable than natural wood, which means capped composite decking will last much longer than any wood deck will. This makes capped composite decking an ideal choice since you no longer need to invest time and money in deck maintenance after the initial installation. The biggest name in the composite decking industry is Trex, the largest manufacturer of wood alternative decking products in the market. Trex was founded in the 1990s making it the original composite manufacturer. Trex has never cut down a single tree in the making of their boards, and is currently the world’s largest recycler of plastic shopping bags. Other well-known manufacturers are TimberTech and Fiberon. 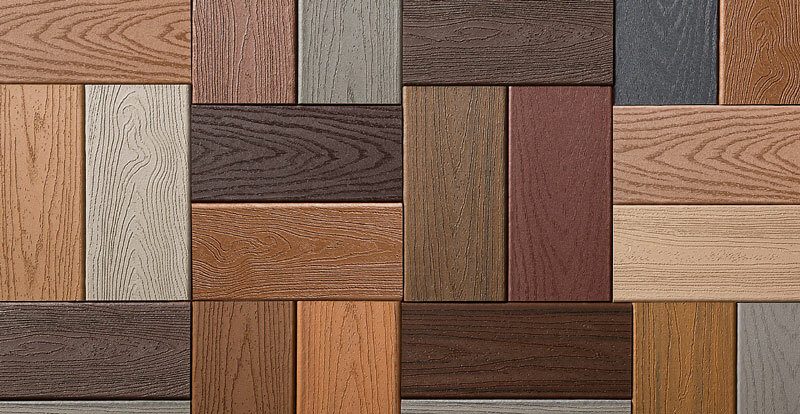 Like Trex, TimberTech and Fiberon offers capped composite decking materials in a wide range of colors and grains. When it comes down to which brand or model is a better choice for you, we’ll walk you through the pros and cons of each. The ultimate question, though, really comes down to color preference. Why is Capped Composite a Good Choice? Traditional wood decks, no matter the type of wood, require regular maintenance. Usually this comes in the form of power washing and sanding, then staining or painting – every board, railing, and spindle. How often this needs to be done depends on the type of wood, but many types need maintenance at least every 2 or 3 years, if not annually. Capped composite decking requires no maintenance, so you will be able to enjoy your deck without having to worry about any regular maintenance. There will be no splinters, no nail pops, no flaking of old paint or stain. The only “maintenance” required is the occasional rinse with your garden hose when debris falls on your deck, such as leaves or pollen. Someone spilled wine or dropped mustard on your deck a week ago and you’re only noticing now? No problem – just rinse it off with water. While the regular maintenance required for traditional wood decks is a hassle, it also becomes expensive over time. Although capped composite decks tend to be slightly more expensive to build than traditional wood, after the initial installation there aren’t any maintenance costs. Because capped composite decks do not incur ongoing expenses, many of our customers have told us the up-front investment is well worth it. While it may seem tempting at first to purchase a less expensive wood deck from somewhere else, a capped composite decking ends up paying for itself after an average of just 3 years. Due to the durable, protective cap, composite decks are not susceptible to environmental stresses like traditional wood decks are. Because the cap locks out moisture, capped composite decking won’t crack, peel or splinter, and they also won’t grow mold. The density of the boards keeps out termites and other insects as well. Additionally, the coating protects the finish on the composite, meaning these materials will not fade or warp with exposure to the sun or to the elements. They also are resistant to stains and scratching, so your deck will stay looking new for years. Drag your furniture over your capped composite deck – don’t worry, it won’t scratch. Adding a capped composite deck to your home isn’t a cost you won’t see any financial benefits from. Most homeowners who add a capped composite deck, as opposed to a traditional wooden deck, see on average an 80% or higher return on investment when it comes time to sell their home. Capped composite decking also offers a realistic, wood-like surface which lasts for 25 years or more, all without any regular maintenance. It’s also an environmentally friendly choice that does not contribute to deforestation. Choosing capped composite for your deck will save you time and money, and it will stay looking new for years. Today’s composite decks have evolved over the years and looks nearly identical to natural wood. Capped composite decking comes in a variety of grain patterns, colors and finishes, each made to look like actual stained or painted wood. These boards come in virtually every color, so with capped composite we can design and build the custom deck of your dreams which you’ll enjoy maintenance-free for decades. https://customdeckcreations.com/wp-content/uploads/2017/07/Capped-Composite-Decking.jpg 414 800 Custom Deck Creations http://customdeckcreations.com/wp-content/uploads/2017/07/Custom-Deck-Creations-Logo-3.jpg Custom Deck Creations2017-10-30 22:50:472018-02-20 03:37:34What is Capped Composite Decking?